Mobile Suit Gundam: Iron-Blooded Orphans brought with it a slew of Gunpla kits that capture its gritty, industrial feel. In 2016, a high-grade kit based on Gundam Gusion Rebake, piloted by Akihiro Altland, came out to Gunpla fans. 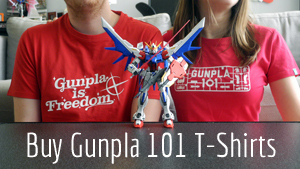 Gunpla 101 contributor the Evil Prof wrote up his impressions after building the kit for the first time this year. Let me start this review by saying I’m a Gunpla novice. So when I first saw the Iron-Blooded Orphans kits at my local comic shop, I wasn’t even aware there was a Gundam series by that name. None of these new kits looked anything like the Gundams I was familiar with. However, I have since fallen in love with the Iron-Blooded Orphans HG line of kits, and its unique, interesting designs. Initially, the HG Gundam Gusion Rebake was not high on my wish list once built, but when my wife brought it home for me, I couldn’t say no. It was time to build. Would the Gusion Rebake exceed my expectations? That’s what I sought to find out. Gusion Rebake was not my first Iron-Blooded Orphans kit. So when I built it, I was already familiar with its structure. With an internal skeleton and armor on top, the frame of the Rebake is very similar to other kits I have assembled. No surprises there. There are some interesting design elements, however. The first thing I noticed was the way the original Gusion was repurposed here. The two pods that extend out to the sides of the Rebake’s backpack are made of the original Gundam Gusion’s leg armor. Additionally, the shield that the Rebake carries is made from the back armor of the original Gusion. I found both of these instances to be a very clever use of recycling. The other design element that makes the Gusion Rebake stand out is its additional set of arms, which give it a more-than-human silhouette. The pods on the back contain an extra arm, or sub-arm. The extra arms give the Rebake a more monstrous appeal. The color scheme for the Rebake is not one of the kit’s strengths. The different colors do work well together. The orange, white and dark gray accents go well with the beige base. However, beige is not a color that I have ever been excited about—even if it is accurate to how the Rebake looks in the show. The other issue I had with the color scheme was that some of the images shown on the box art and in the instruction manual included highlights that clearly weren’t included with the straight build kit. The most significant example would be the Rebake’s shield. The armor plate of the original Gusion, used as the Rebake’s shield, had different pieces for the vents/thrusters. This detail is lacking on the Rebake shield and that is a little disappointing. As I said before, I do not have a broad range of experience building Gunpla. As such, gauging difficulty is something of a tough task for me. In terms of assembling the kit itself, there were no particular snags that jumped out at me. All of the pieces fit together well without being too tight or too loose. There were a few pieces that were oddly shaped and made panel lining harder than usual, but nothing too arduous. For me, the most significant difficulty to this kit was sticker application. They were a welcome addition as they helped give highlights to an otherwise bland color scheme, but I struggled getting some of them in place properly. As an example, there are two white allover stickers that completely cover the “spars” on the top of the Rebake’s helmet—if you do it right. You will most definitely need your tweezers to get these put in place properly. The Gusion is exactly as poseable as I would have expected a somewhat bulky high-grade kit to be. There are articulation points at the ankles, knees, hips, waist, shoulders, elbows, wrists, and neck. Additionally, the modules on the back can be adjusted and the second set of arms has its own points of articulation. This allows for the Rebake to be put into any number of action poses. The only difficulty comes from these previously mentioned sub-arms. The Rebake carries a pretty heavy backpack and therefore is significantly back-heavy. It makes the Rebake slightly more difficult to stand up on its own. The Rebake comes armed with a long rifle along with the previously mentioned Gusion Shield. What struck me about the inclusion of the rifle was that so many of the mobile suits from Iron-Blooded Orphans focus on melee weapons, but the Rebake does not come with one. The rifle itself is only a few pieces and easily constructed, so what was stopping them from including the Gusion Rebake Halberd? Rebake comes with two heads. You can still get the missing melee weapon, the Gusion Rebake Halberd (seen in a picture above), but you’ll have to pay extra for the accessory pack: MS Option Set 3 & Gjallarhorn Mobile Worker. That said, I really do like the Rebake’s shield. While I did curse the amount of panel lining required at the time, I really like the amount of detail. The kit also comes with a connector part that allows the shield to be attached to either forearm and stored in the rear skirt armor. Be aware that this storage configuration will increase the “back heavy” concern with the kit. The final extra part is an alternate head. When the Rebake is using the rifle it can switch from its canon-based Normal Mode to Aiming Mode. The alternative head is used to show the Aiming Mode in action. Yes, building this alternate head requires application of a couple more finicky stickers, but they weren’t too bad. I have mixed feelings about this kit. On the one hand, I like the gimmick. The extra arms are unique to the series and adds to the different poses that can be made. On the other hand, I find the beige color to be less than inspiring. In fact, without the extras from the Gusion I would describe the design of the mobile suit as generic. My subjective preferences aside, it is a solid kit. It is sturdy in its construction and highly detailed. It would be a worthy build for any fan of the Iron-Blooded Orphans series.